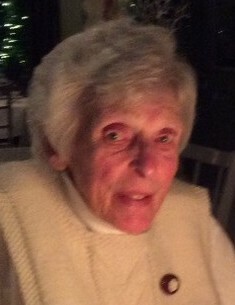 Gertrud Elisabeth Meyer, 92, of Sister Bay, passed away peacefully with loved ones by her side on Friday, February 8, 2019 at Scandia Village. She was born January 10, 1927, in Bremen, West Germany, the daughter of the late Friedrich and Anna (Hoyer) Meyer. When the other girls from her camp talked about going to a nearby ammunition factory for work, Gertrud frantically wrote to her mother to transfer her from the factory to a nurse in training during WWII at the Bremen Red Cross Hospital. Because nursing was as legitimate of a job as working to make ammunition and with the shortage of trained nurses who were at the front, the job was very demanding and overwhelming at times. After going on to the University to receive her degree in the fall of 1951, Gertrud came to the United States to learn more methods of teaching . Gertrud returned to Germany with her new skills only to realize she missed America and when she came back, she made Wauwatosa her home. After teaching grade school, Gertrud started teaching German and later, became the head of foreign language in the Wauwatosa School District. After 23 years of teaching, she retired in 1982 and moved to Sister Bay. Gertrud traveled extensively during retirement and in 1991, she started going to Elderhostels each year in the United States and Canada, as well as visited her family in Germany. Gertrud was a tour guide volunteer at the light house in Peninsula Park from 1994 until 2009. From 1996 until 2010, Gertrud and her friend, Gretchen Maring, taught knitting to countless students at The Clearing in Ellison Bay. She had many hobbies, that she seemed to master and do with ease whether she was knitting, sewing, biking, hiking, gardening, or doing basketry. Gertrud enjoyed listening to classical music. Gertrud had many friends, both in Germany and America. She was loved and admired and touched the lives of many. She will be missed very much! Gertrud is survived by her brother, Hans Ludwig “Luten” (Anneliese) Meyer of Westerstede, Germany and nephews, Claus (Iris), Uwe (Silke), and Thorsten (Nicole) Meyer, all of Germany; great-nieces and nephews, Alena, Niklas, and Thore, Christoph, Philipp, Kira, and Jelte, and Josephin and Carolin. Gertrud will be missed by her “American Family”, Jeanne and David Aurelius, Lauren Aurelius, Marjorie June Aurelius, Fred Wahlen, Martha (Aurelius) Hutchinson, Adam Hutchinson, Sylvia Youell, Tom and Sue Sullivan, and Doris Prenzler; and close friends, Nancy Williams, Carol Ama, Bob and Sharon Kaminsky, and Alysanne Burkhardt. Gertrud’s life will be celebrated at 1:00 p.m. on Friday, February 15, 2019 at Casperson Funeral Home in Sister Bay. Gertrud will be laid to rest next to her lifelong friend and companion, Dr. Blanche Bradley in the Blossomberg Cemetery in Fish Creek. Visitation for friends will be from 12:00 p.m. until 1:00 p.m. on Friday at the funeral home. Expressions of sympathy, memories, and photos of Gertrud may be shared with her friends through her tribute page at www.caspersonfuneralhome.com.